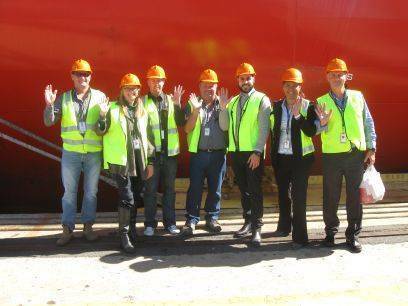 The Export Council of Australia in conjunction with Wallace International recently accompanied some of Queensland’s top exporting businesses on a Port and Vessel tour to help gain valuable insight of what actually happens to your products once they leave your company. In the lead up to the Premier of Queensland’s Export Awards a number of 2013 winners enjoyed an exclusive tour at the Port of Brisbane, one of Australia busiest ports. Logistics professionals from Capilano Honey, Super Sprout, Digga Australia, and Minecorp had to pass a security clearance before boarding the Cap Campbell on route for New Zealand and Asia. Queensland Communications Manager Richelle Ward said it was the first time any of the group had boarded a cargo vessel so everyone found it really fascinating. We had Q&A with the Captain, followed by the Chief Officer’s informative tour of the vessel from the engine room to the bridge, and the many steps in between! We also experienced firsthand the new sophisticated technology used to load and unloading the vessels,” Ms Ward said. The Export Council of Australia would like to personally thank Wallace International, Hamburg Süd, DP World, and the exporting businesses for helping make this day possible.